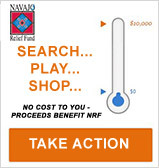 The Navajo Relief Fund uses many resources to document the information presented on our website. We have first-hand accounts from the Indian people we serve as well as newspapers, both Native American and mainstream, and data obtained from respected publications and research documents by noted authors. The following are some of the resources we have researched to provide an accurate and respectful look at the Indian people we work with and serve. By Bruce E. Johansen and Donald A. Grinde, Jr., published by Henry Holt in 1997, this is an excellent collection of biographies of 600 American Indian lives. Native American history : a chronology of the vast achievements of a culture and their links to world events. By Judith Nies, published by Ballantine Books in 1996, this is a wonderful chronology of events in American Indian history that compares these events to what was happening in the rest of the world at the same time. A guide to America’s Indians - ceremonials, reservations, and museums.